Hall of Fame Night Preview: T-Birds at Bears, 7 p.m.
RADIO: WQIC-100.1 FM, Fox Sports 1460-AM, WOYK-1350 AM, Zack Fisch, the Voice of the Bears and Freddy Cassivi on the call. 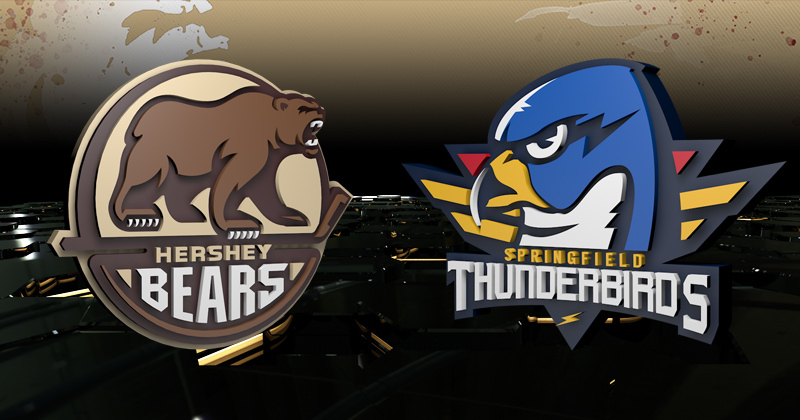 ​Tonight, the Hershey Bears host the Springfield Thunderbirds, AHL affiliate for the Florida Panthers. It is the second of six meetings this season between these two teams. Prior to tonight’s game, the Hershey Bears Hockey Club Hall of Fame will induct the Class of 2018, which includes Andy Branigan (player), Ellard “Obie” O'Brien (player), George “Red” Sullivan (player) and Mitch Grand (general). Former Bears broadcaster and current Voice of the Capitals, John Walton, will serve as emcee. The Hershey Bears open a new month after closing November with a 3-1 loss to the Wilkes-Barre/Scranton Penguins last Wednesday. Liam O’Brien was stopped on a penalty shot only 6:38 into the game, and Thomas Di Pauli scored a pair of first period goals for the Pens on two breakaway tries. Adam Johnson scored the lone goal in the second period to give Wilkes-Barre/Scranton a 3-0 cushion after 40 minutes. Jayson Megna broke the shutout and capitalized for the Bears on a 2-on-1 rush with Sergei Shumakov in the third period’s opening minute. Pens goaltender Anthony Peters held Hershey scoreless for the remainder of regulation to round out a 3-1 final. The Springfield Thunderbirds are fresh off a 5-2 win over the Bridgeport Sound Tigers on the same night. Anthony Greco scored the first two goals of the game for the T-Birds, and completed the hat-trick at 19:32 of the third period. Patrick Bajkov and Jayce Hawryluk also scored for Springfield. The Bears and Thunderbirds last met on November 10 in a 3-2 Hershey win at Giant Center. All three goals for the Bears came on the power play, and the penalty kill went a successful 6-for-6. Ilya Samsonov stopped 31 of 33 shots en route to being named first star honors. Jayson Megna, Nathan Walker and Riley Barber were the Hershey goal scorers, while Jayce Hawryluk and Thomas Schemitsch tallied for Springfield. On Friday, the Bears announced the club has signed defenseman Jake Linhart to a professional tryout. Linhart joins Hershey after opening the season with the ECHL’s Adirondack Thunder. The 5-foot-11, 185-pound defender appeared in 19 games with Adirondack, scoring 11 points (two goals, nine assists). The rookie registered his first professional goal in Adirondack’s 4-3 win at Brampton on Oct. 21. If the University of Wisconsin product dresses tonight, it will mark his AHL debut. Bears forward Mike Sgarbossa is Hershey’s only current player to have played for the Thunderbirds. Sgarbossa appeared in 14 games with the T-Birds in the 2016-17 season and posted 12 points (four goals, eight assists). Two of the four goals with Springfield came on the power play. Through 21 games this season with the Chocolate and White, Sgarbossa currently sits as the Bears leading goal producer (nine) with two occurring on the power play. Thunderbirds forward Bobby Farmham has now played against the Bears while representing four different teams across seven seasons. Dating back to 2011-12, Farmham enters tonight with 42 regular season games versus Hershey with a career total five goals and 12 assists. Farnham’s first game against Hershey came on Apr. 15, 2012 in a battle between the Hershey Bears and the Worcester Sharks. Farnham more infamously played 30 games against the Bears representing Wilkes-Barre/Scranton from 2012-2015.